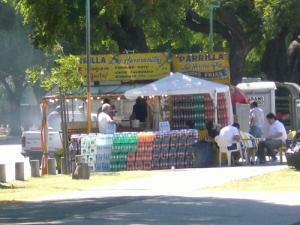 The choripan is Buenos Aires’ answer to the hamburger stand. It consists of a sausage made out of beef and pork, hot off the grill, split down the middle, and served on a roll.The best place to eat choripan in Buenos Aires during the daylight hours has got to be along the Reserva Ecologica just across from Puerto Madero in Costanera Sur. There you’ll find stand after stand of chorizo and other carniverous delights with all the fixings, smoldering along the boardwalk. This beautiful choripan photo taken by Asado Argentina. The Reserva runs parallel to Rio de la Plata – one of Buenos Aires’ two rivers and home to Puerto Madero, the site of new development in recent years. While Puerto Madero boasts shiny high rises and trendy eateries, a quick walk across the way to Costanera Sur reminds you that Argentina is in Latin America. Each stand supplies music and asado smoke and is equipped with its own proud cook – cook’s hat, apron, and all – while a table of condiments dare you to challenge your stomach with onions, chimichurri, olive-flavored mayonaise, mustard, and salsa golf (thousand island dressing) – all of which sit out uncovered and vulnerable to the elements. 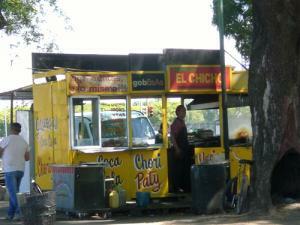 The other great street food of Buenos Aires is the superpancho. A pancho is a hot dog – made out of pork. A superpancho is a hot dog with trimmings – usually onions or sauerkraut and mayo. With such a heroic name, you’d think the superpanchowould be your first line of defense after a long night of revelry – but think again. Pizza and empanadas aren’t hard to come by at all hours of the night, panchos are offered in every corner store, but chorizo brings all the boys to the yard. El Superpancho will never defeat El Choripan in the battle for best street food. In Buenos Aires, el choripan – naked, bread and chorizo alone – is king. 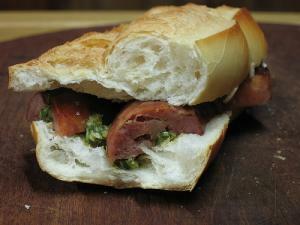 Because of your CHORIPAN post… I’m listing you on my blog. You nailed it… and I’ve been here for more than 4 years. Thanks again and let’s ALL meet for a Chori in Costenera Sur! si! let’s do it. never can get enough choripan and carbon flavored asado smoke! pancho is common salchicha, but larger. are you sure is made of pork? This page rendered in 0.365 seconds.